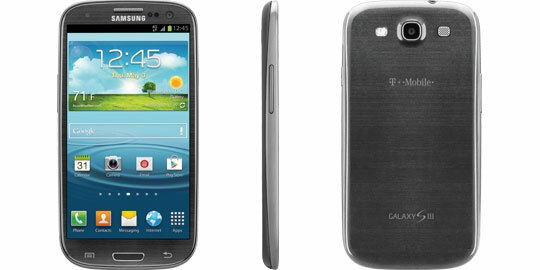 T-Mobile has officially launched the Samsung Galaxy S3 in another color. And without any further adieu, that new color is Titanium Gray. That being said, the new Titanium Gray color is available in the 16GB model and will serve to replace the 16GB model in Pebble Blue. T-Mobile will continue to carry the 32GB Pebble Blue model as well as the Marble White model in both 16GB and 32GB. The pricing remains the same, which means those interested will be able to pick up the Titanium Gray model for $279.99. As of this time the T-Mobile website is showing the 16GB model in Marble White and Titanium Gray and the 32GB model in Marble White and Pebble Blue. On the flip side, T-Mobile retail stores were expected to continue selling the 16GB Pebble Blue model until they run out of inventory. Basically, if you wanted a 16GB Pebble Blue Galaxy S3 with T-Mobile you may want to make that purchase sooner rather than later. All said and done, similar to the pricing, the only difference here is in exterior color. The Samsung Galaxy S3 still sports features to include a 4.8-inch Super AMOLED HD display, dual-core 1.5GHz processor, 2GB of RAM, 1.3 megapixel front-facing camera and 8 megapixel rear-facing camera. Lastly, the handset is running Android 4.1.1 Jelly Bean with the Samsung TouchWiz user interface.